Max doesn't remember his mother, who was murdered by burglars before they emigrated from Beirut to New Jersey. He lives with his father, Rasheed, who is enamored of his concept of American culture—baseball and barbeques—and tries to shed his Lebanese heritage completely. "When we are in America," Reed (for he goes by Reed in America, not Rasheed) tells Max, "we are Americans." Rasheed has a singular purpose in life: to provide Max with a joyful childhood. He showers his son with gifts out of a belief that he deserves all and is capable of anything. Max wants nothing more than to convince his father that he is a successful single parent. The only thing that can disrupt their peaceful universe is the truth—which it does, with force. When Max turns 17, he learns from Rasheed's ex-girlfriend that his father has been lying to him. Max's understanding of the world is so rocked that he is subsequently launched on an uncertain mission to Beirut and then Paris. Lifted by the Great Nothing is a startlingly graceful and often hilarious coming-of-age story about the lengths we go to in order to preserve the untruths by which we live. With its poignant relationships, unsettling misadventures, and surprising love stories, it is a touching and devastating portrait of a young man coming to terms with his country's—and his own—violent past. Like some wacky, delightful dream . . . The family truth the father tries to hide, the discoveries of young manhood son Max seeks to find--there's just so much of everything going on in these pages that captured my attention completely in this charming novel about function and dysfunction, giving and loving, so much that made me wonder, made me laugh. Alan Cheuse, "All Things Considered," "NPR"
Sentimentality sometimes seems like a given in coming-of-age stories; fortunately, Karim Dimechkie's debut, "Lifted by the Great Nothing," avoids it at every turn . 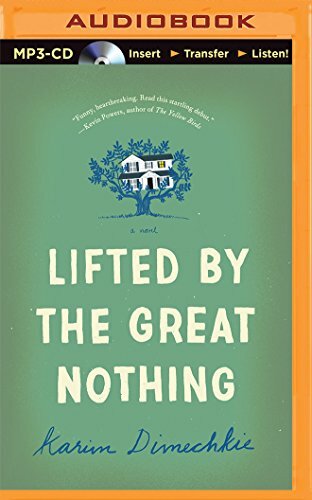 . . A rendering of a family torn apart not only by a civil war, but by a stubborn unwillingness to concede to the differences within itself, "Lifted by the Great Nothing" is awkward, challenging, and funny. It's sharp and frank--and, like any good family, it stays with you. "The Daily, the Paris Review blog"
[A] soulful rumination on fathers and sons and one boy's coming of age. "San Francisco Chronicle"
[A] whip-smart novel about immigration, identity (sexual, social, political) and the inevitable end of innocence. "MORE Magazine"
Funny, poignant and heartbreaking, a true-to-life coming-of-age novel . . . Dimechkie is a splendid storyteller, lacing his prose with apt and unexpected analogies and metaphors . . . Dimechkie got everything right. "Minneapolis Star Tribune"
"Lifted by the Great Nothing" plays a fine-tuned rainbow of delicate emotions like a harp. "DuJour Magazine"
Dimechkie's character-driven coming-of-age novel is less about the immigrant experience than about a literal and figurative journey of self-discovery. It is also a love story between father and son, yes, but also between Max and the older woman doctor who lives across the street. And in a novel featuring Lebanon, it is no surprise that politics and social justice also play a part. All of these disparate elements come together seamlessly as Max struggles to deal with the new realities of his life. "Booklist"
A finely nuanced look at race, gender, and power in American society. Dimechkie is at his best when allowing his great development of character . . . A promising debut penned in vivid, suspenseful prose that gives a new spin to the classic tale of fathers and sons. "Kirkus Reviews"
Dimechkie writes without restraint, and the book covers homosexuality, racism, identity politics, and immigration . . . A well-written, engaging story . . . showing a writer with true potential. "Publishers Weekly"
Endearing . . . An exhilarating and devastating encounter with disorientation. "San Antonio Current""